This review has been a long time coming and I want to apologize to Baby Boutique Hair Bows for the delay. There was some confusion and the bows were not delivered to me, but to a neighbor (2 buildings down, no less), and it took this long to find them. These bows are by far the best bows I've reviewed. I don't mean this as an insult to any past boutiques :) I just want to stress how amazed I am with them. They're sturdy (I tugged, pushed, pulled, and they didn't come apart), cute (see picture), and just overall great. Even though they are great, at $17.50 for a set, the price is a bit steep. They're worth every penny, and are super durable so you'll get lots of use out of them, but we all know what prices are like on bows nowadays so the $17.50 just kind of stings. Especially if you have more than one pretty little girl to buy for! Overall, 3 stars. If they were more in my price range, they'd have a definite 5 star rating. Please check Baby Boutique Hair Bows on Facebook. Watch their page for sales! Bows like this are hard to come by. 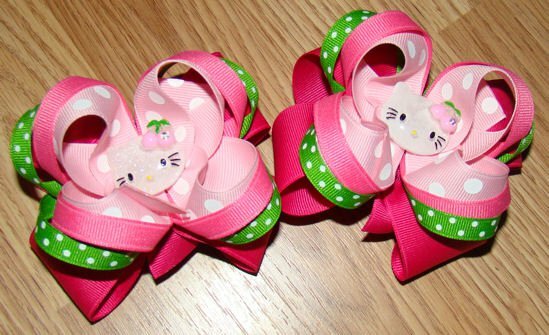 Just wanted to clarify that the price is $14.00 for the set and 3.00 for shipping any amount of bows flat rate. Thanks.